BENIN—THE member, representing Oredo Federal Constituency of Edo State in the National Assembly, Mr Omoregie Ogbeide-Ihama, has scored the administration of President Muhammadu Buhari low on security and economy, just as he called on the government to deploy the necessary security apparatus to check the current serial killings now going on across the country. Ogbeide – Ihama who made the call while speaking with journalists in Benin City, yesterday, stated that within this year alone, the country has recorded several senseless killings while nothing has been done to stop the carnage and no plan on how to avert future occurrence. He said, “As you can see, people were killed, just few days ago, you see what happened in Offa, Kwara State, you see what has been happening in Benue, in Taraba, Plateau, Zamfara even in the Eastern states and Rivers state is not left out in the massacre. “ I won’t give a pass mark to the Federal Government in terms of security and economy because it is visible everywhere even to the blind that there is hunger strike in the nation and at the same time Nigerians no longer feel secure, even in their homes and outside their homes or on the road. So, it is imperative that the government must sit up and ensure that the areas of security and economy are covered because apparently if you are not doing well in any sector, it means that you have not lived up to expectation. 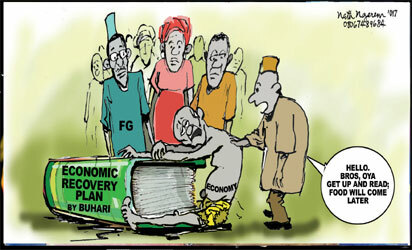 The post Rep scores Buhari low on security, economy appeared first on Vanguard News.